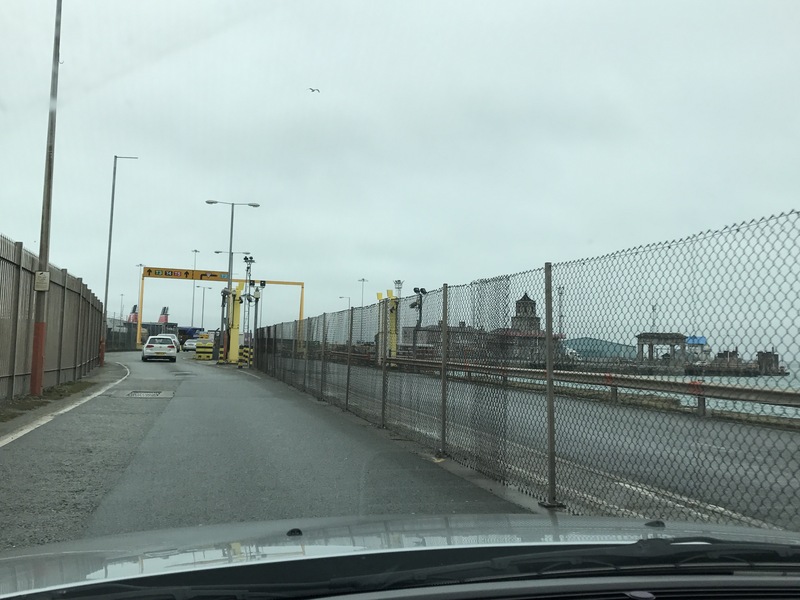 On our recent trip to Ireland, we decided to get to Dublin using the car ferry from Holyhead to Dublin. I found the whole process very interesting, so I thought to share the experience on the blog. I bought the tickets on-line with direct ferries. I like direct ferries as it allows you to mix and match your onward and return tickets between different ferry companies to get you the ferries most suited to your schedule (and budget). We decided to take the 1.50 p.m. ferry out on Wednesday the 29th March and return on the 8.20 a.m. ferry on 2nd of April, with Stena line. Nothing much to report here, other than to say the traffic around Birmingham was heavy. Birmingham to Holyhead without traffic is usually 3 hours 15 minutes, but as we left around rush hour it took us 4.5 hrs. This included a breakfast stop and a quick dash to Halfords to buy a GB sticker. When you go to Ireland, you need to put a GB sticker on your car, unless it has “EU” plates. You also need to take your insurance details and your UK driving licence. 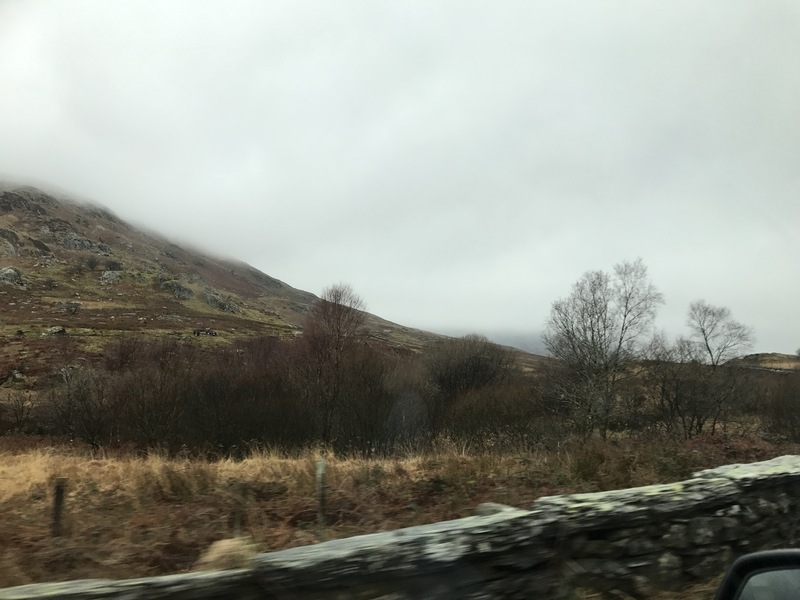 Second half of the journey is through North Wales, and is very picturesque. The ferry port is well signposted as you approach Holyhead. There are separate entrances for trucks and cars and we headed towards the latter. I didn’t have any tickets with me, just the ferry booking confirmation email. Nevertheless, we pulled into the drive through check-in and they issued us a ticket straightway (I think they recognised the car number plate). Next we were directed towards the customs check, where they asked a few questions about our travel plans. After the customs check, we were directed towards the pre-ferry parking area. Here there are several lanes, and we were asked to park the car in lane 16, which already had 4 cars. We were also told that there was 45 minutes until boarding time, so you can park the car in the lane and head over to the Stena lounge next to the parking area. There’s a cafe and bathroom facilities and a mini maritime museum. Cars started boarding about 50 minutes before departure time. When it was time to move, the first car followed a signal car, and everyone else followed the car in front of them. After what seemed like a big detour (because of construction works at Holyhead port), we approached the ferry, and drove straight into one of the lower decks. We parked the car here and went upstairs. We were travelling on the Stena Adventurer. The lower decks are for vehicles. Decks 7 and 8 is the passenger area. Upper decks have private cabins (which you can book for the duration of the crossing for an additional fee). The stair carpets smell a bit, but otherwise, facilities onboard are good. There’s a self service restaurant serving hot food and drinks, lots of seating areas, including one at the front where you can gaze out into the horizon. There’s a kids play area, free cinema (not the latest, but reasonably new films), video games area and a small shopping area and a truckers lounge. There is also free wifi on board and it was fairly fast. The food in the restaurant, although nothing to write home about, is perfectly fine and there’s a good selection available. There were only a handful of passengers on the ferry and overall it was very pleasant on board. There is also a Stena Plus lounge, for an extra fee, provided free tea and coffee and snacks, and it seem quieter. However, on our trip, there ferry was largely empty, so it didn’t appear that Stena Plus was worthwhile. After a welcome announcement and safety messages, the ferry left on time. The sea was slightly choppy, but not too bad. Sitting at the front and looking at the horizon helped keep my sea sickness at bay. 3 hours later, we were pulling into the Dublin port. It was very interesting to see the front of the ferry completely lift up as it approach the jetty. A series of announcements told us when to go back to the cars. 5 minutes later, we were driving out. As we drove out, there was a quick immigration check – with a friendly immigration officer who smiled and welcomed us to Ireland. Following this, we exited the port and on to the next stage of our Irish Adventure. Our return journey was very similar to the outward journey. We used the drive through check-in, and the Dublin ferry port had similar Stena lounge facilities. One thing to note is that traffic in Dublin is very heavy, especially with a lot of road works. Last check-in for the ferry is 60 minutes before departure, therefore leave plenty of time to drive to the port. Since it was an early ferry, I had booked us breakfast on board. 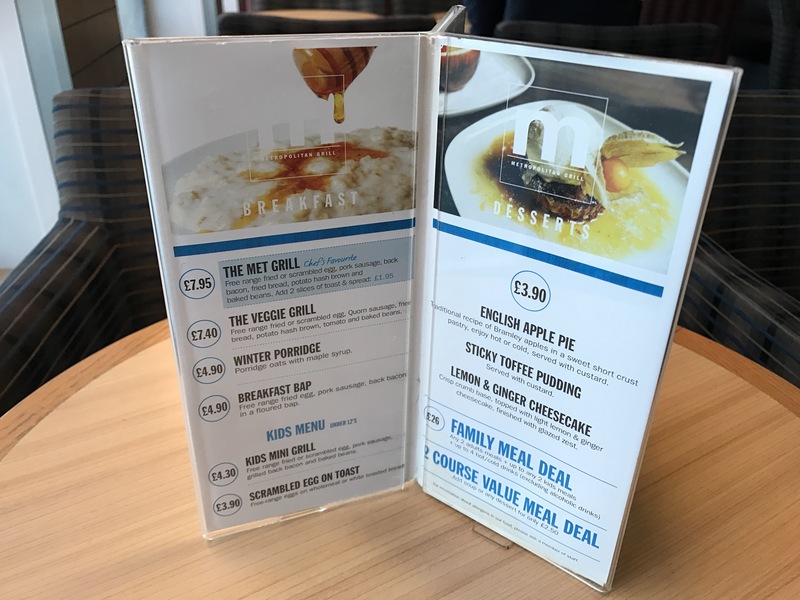 I had paid £17.00 for two breakfasts. This allowed us an “adult grill” meal (the most expensive item on the menu) and a hot drink. In hindsight, I didn’t need to do this, because there was no saving over on board prices, and in fact we ended up paying more because only one of us had the adult grill option. Please note: All costs are estimates, and were correct at the time of writing. 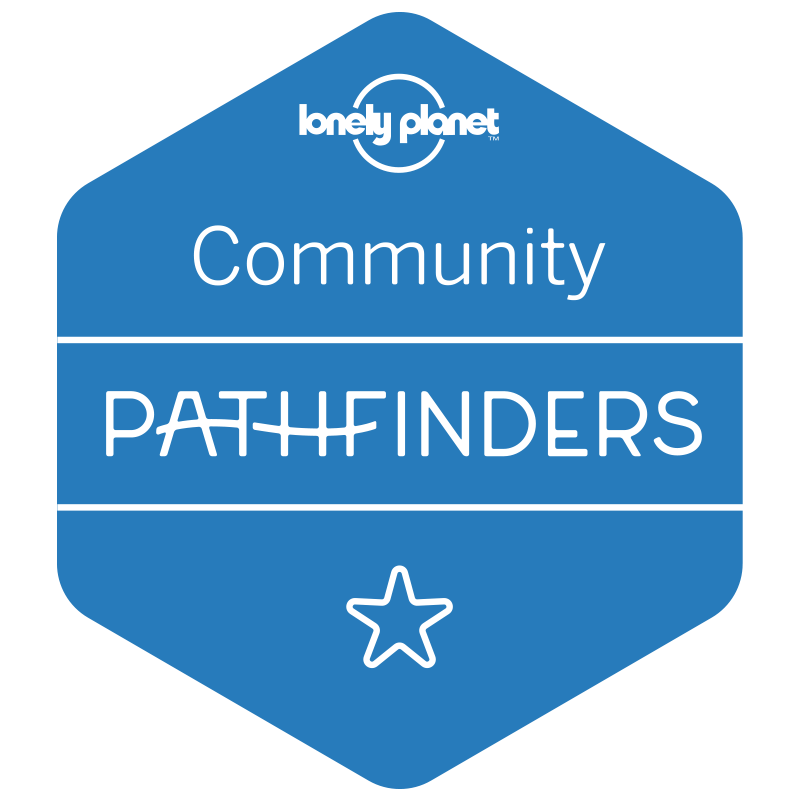 Wherever possible, I tried to compare like with like – for example the car hire cost for a similar car to our own, with Satnav and similar insurance cover. On this occasion, the Fly+Drive option was cheaper by about 20%. If the trip was for more that a couple of days, or there were more people, the ferry would be cheaper. Similarly, for a shorter trip (or less people), flying is definitely the way to go. There is no doubt that when it comes to journey time, the Fly+Drive option wins hands down. Verdict: To fly or to Ferry? There are a number of advantages to ferry travel. It’s more comfortable. There are no luggage restrictions, therefore no need to worry about packing – just throw everything in the car and drive. There is also no need to worry about buying stuff whilst you are away and finding the space to bring it back with you. I also found the experience less stressful compared to flying. On this occasion, the ferry was both a more expensive and time consuming way of getting to Ireland. However, it would have been more cost effective for a longer trip. I think in conclusion, the answer is it depends – if you are going to Ireland for more than a few days, the ferry is definitely the way to go. For shorter trips, I think flying is best.